Keep Pinning, Keep Sharing, Keep Commenting! We are loving it. 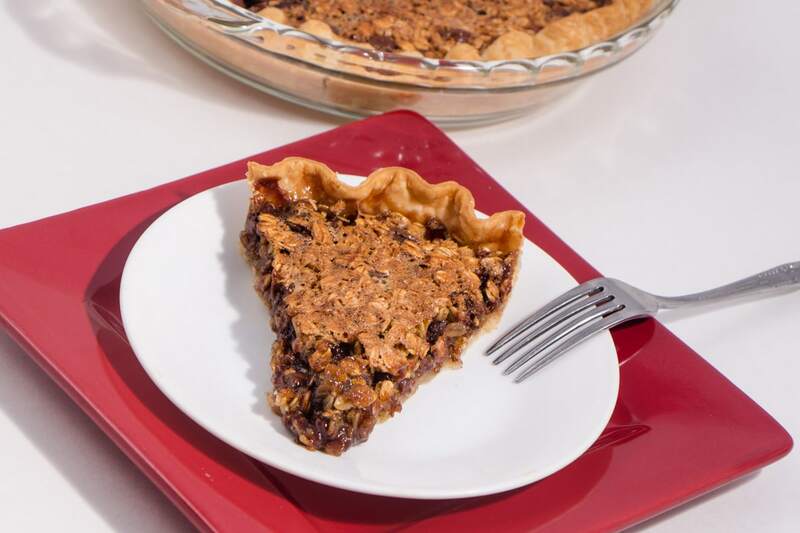 I wish I knew where I found this recipe for Oatmeal Chocolate Chip Cookie Pie so many years ago, because it has been a family favorite for over a decade. As a mom, I love that this pie whips up in really less than 2 minutes. I even keep these ingredients on hand because I never know when I’ll have a group over and need a quick dessert. This fits the bill and I’ve always had people ask me for this recipe before they leave. 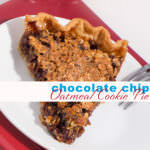 The Oatmeal Chocolate Chip Cookie pie is really as easy as pie! If you didn’t take time to watch the video, go do that now. It’s a live video of when I made this pie over Thanksgiving and it truly is just that easy. No edits, no speeding up time, it’s just super quick to throw the Chocolate Chip Oatmeal Cookie Pie together. Of course it does take a few minutes to measure out ingredients but regardless, making this Oatmeal Chocolate Chip Cookie pie is ‘Easy as Pie’. I like to mix it all up in one bowl, there is just no reason to make a bigger mess than necessary. I also stir it together with a large spoon. No need to get out a mixer, it’s just not that sort of recipe. In the end all the chocolate will melt into the other ingredients and will make that yummy texture like a Pecan Pie has. So rich and delicious! Feel free to add in nuts if you like. In my home, my boys like it plain. 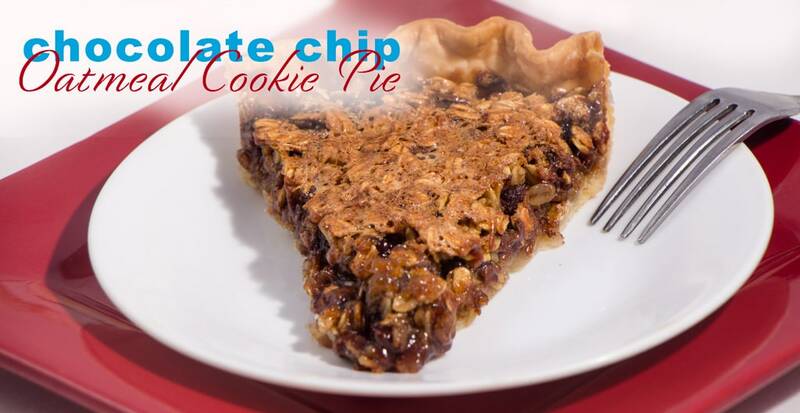 Just like this has been a family favorite for game nights with friends, Thanksgiving where I make 2 because the Chocolate Chip Oatmeal Cookie Pie does get eaten that quickly, or any other time of the year. Just have your Pie and Eat it Too! After you mix this up, it bakes in a preheated oven set to 350 degrees. The Oatmeal Chocolate Chip Cookie Pie may not look all that great, but regardless…it’s delicious so give it a try! Of course serve this pie with Ice Cream and let it melt into the pie. Oh yum yummy! PS – Oatmeal Chocolate Chip Cookie Pie also freezes well too. Make it a head and throw it in the Freezer. Pull it out and let thaw on the counter for 3-4 hours before serving. Perfect for when company stops by. Oatmeal Chocolate chip Cookie Pie is as delicious as it tastes with the flavors of cinnamon and oatmeal combined with a traditional chocolate chip cookie, how could you go wrong! Comfort food at it's best! 3/4 Cup Oats *I sometimes add 1/4 cup more oats because I love it! 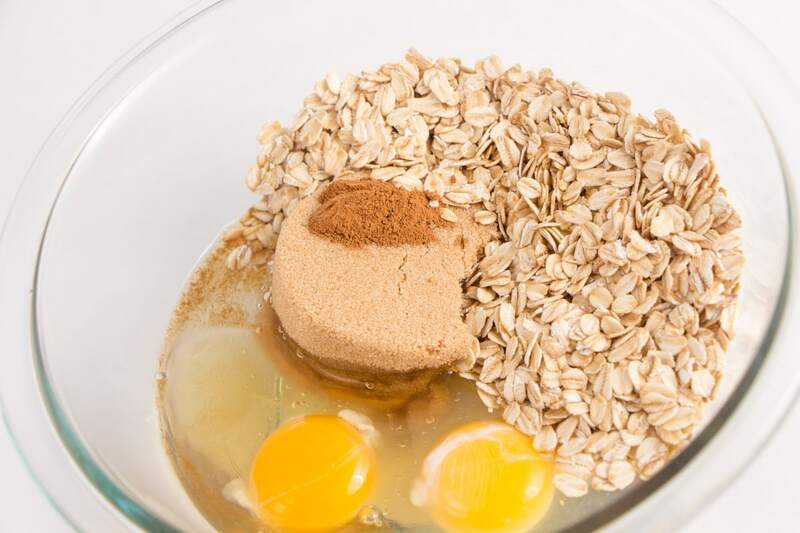 In a mixing bowl, combine eggs, brown sugar, Light Karo syrup, oats, vanilla, and cinnamon. Mix to combine. Add chocolate chips. Pour into a frozen pie crust. 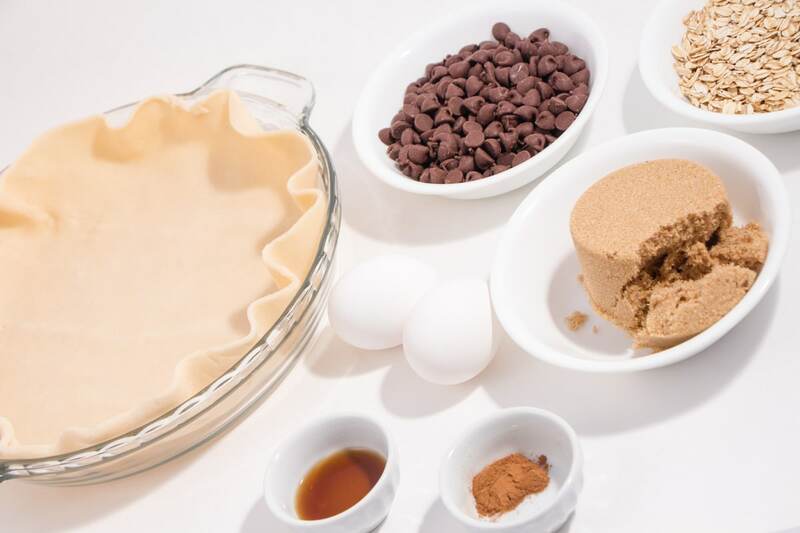 There is no need to bake the crust prior to baking pie. Bake for 30-35 minutes. I will watch it the last 10 minutes. Sometimes it's done in about 25-30 minutes. Just made this, it’s so good but instead of pie crust we did half Oreos with Graham crackers. The inside is oozing not sure if it’s the karo Suriname but it’s very good! Oh wow! I bet that was delish! When it’s hot it will ooze a little, as it cools it sets up! This looks absolutely scrumptious! I’ve never heard of anything like this “pie” before. No wonder it went viral! Good job! It’s WONDERFUL! It’s crazy how easy it is and it tastes so good, both warm and the next day. Delicious! Oh yeah – Bring it!! This looks so good. I will be pinning this and try it out at our next get together with friends. This looks amazing! I love oatmeal chocolate chip cookies so I think this is right up my alley! I have yet to try and make a cookie pie. This one looks delicious, so definitely pinning for later! You won’t regret this one. The simplicity alone makes it worth it! What a unique dessert. 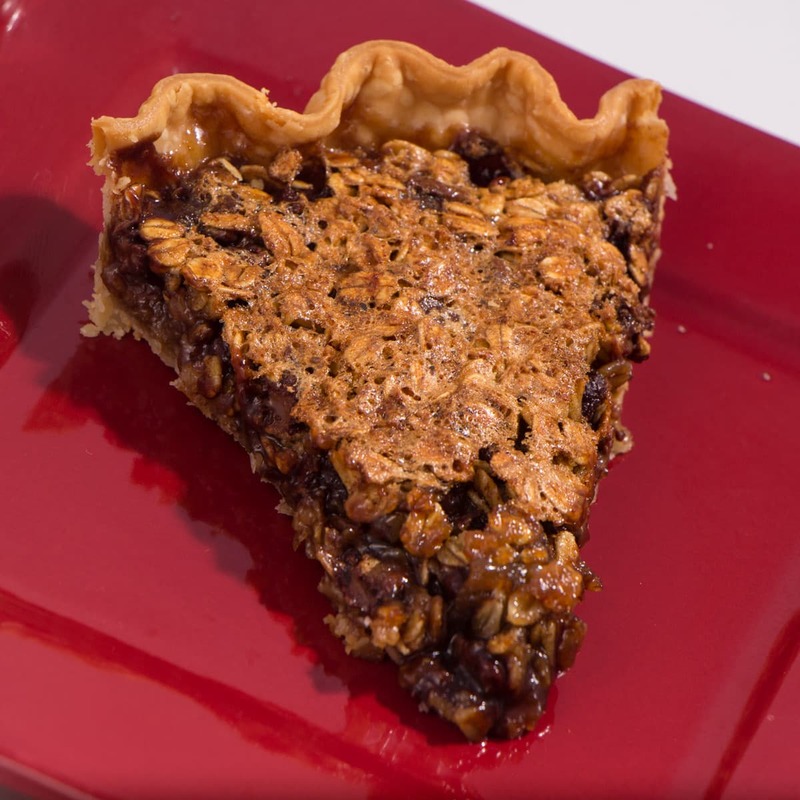 The best of both worlds – oatmeal cookies and pie – brilliant!! I absolutely love baking with oats too. Definitely saving this to try later. It is the best of both worlds. It’s also super simple with only 1 bowl to clean up. My favorite type of recipe! Ah-mazing!! I often have cravings for oats and I’m always looking for new ideas to cook them up! You will love this recipe. It’s perfect. Looks amazing! One quick question though…which type of Karo syrup? Light corn syrup, dark corn syrup or pancake (I think that’s what it’s called, the medium colored) syrup? Michelle – Great Question. I prefer the Light Karo Syrup. You can use the Dark, it would give it a much sweeter richer taste. I’ll update my post to help others! Thanks! This sounds so tasty! Something just a little different than your standard chocolate chip cookies. It is a different but yet so delicious. OMG I literally cannot wait to try this it looks perfect. Just my kind of treat? This looks amazing!!! I love anything with Chocolate and Oatmeal combined. The simplicity is perfect! Thanks! What an awesome, fast and easy recipe! Wow, I can’t wait to try this one with the kids. Yum! I’ll have to try this!! Interesting using the karo syrup. Going to have to give this a try. Plus I have everything needed all ready in the pantry.